We sat down with Martino Gamper during his recent visit to San Francisco for his talk at the Arkitektura Assembly design series. Gamper talks food, community and how his accent eludes his own culture. We discover that lunchtime at the studio is critical for both community and creativity, how he left school at 14 and trained as a furniture maker and the ways in which his wife, a sculptor, inspires him. 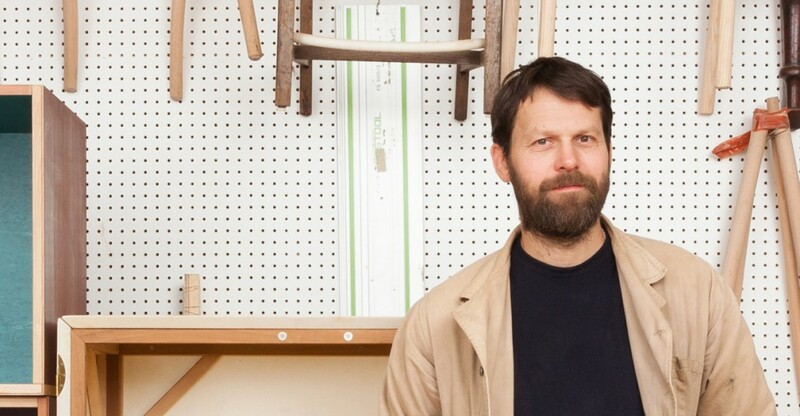 Listen here to our conversation with Martino Gamper or subscribe to the podcast through iTunes. Take the conversation with you and keep Design In Mind. Below is a transcription of the Design In Mind interview with Martino Gamper. [laughs] Of course, when you are manning a farm, it’s a lot of work. There is a lot of work but food has always been this central part for me to get a sense of who you are with, who you are sharing, in that sense, a meal. I think life can be so frantic and fast and you don’t even have time to have a meal. [laughs] And it makes people feel more part of it too. Yeah, also we would use money to design things that we would make. We would make cutlery. So that became kind of circular in a way that felt like quite natural. So food also gave me, I mean very early on, the possibility to experiment and to try things out. And my Mom would very much give me the freedom to cook whatever I wanted to cook. She was trying to obviously teach me and show me how things are done in a traditional way but I really had freedom too [laughs]. And I think that was very healthy in a way, that you don’t have to be scared of cooking, it’s not something scary. And we learn as well about ingredients, certain ingredients. There is certain methods, there is certain techniques and there is a finale in the end. You know where people get to sit together and taste. Martino: Yeah, tangible. I think that is something maybe I always try to recreate in my furniture. There is certain material, material that’s got a certain history, a certain provenance, a method. There are many different methods but not that many again in design or in furniture, you know there aren’t that many. Martino: —roasting, braising , boiling. Martino: Frying. You know there aren’t that many. So within that scope you have to kind of create something. I think that’s the exciting thing. There is something tangible but you can still move a little bit, you can still try to kind of find different combinations, different ways. Again, coming back to the table of serving it and so on. The rhythm, the season, of course I mean it’s a big thing. I think that is something I really missed initially in London, I felt like there wasn’t really seasons here. People didn’t live or cook by the season. I think now , you know 16 years later, there is but when I first came to London I was like where is the season, where is the season of cooking here? In Italy it is very different? Yeah, in Italy cooking is very much by the season. Because that’s the produce that you find and people go out and do a lot of foraging as well. That’s how I was brought up, in a way, going to forage. Be it mushrooms, be it some kind of special little wild salad or asparagus. And you have a garden? We have an allotment in London. The neighbors gave us their bits so it’s a little plot. And we grow asparagus. Actually Francis [my wife] is probably more involved than I am in the garden. It is her project more than mine. You just reap the benefits. I reap the benefits but I usually dig…sort of. Yeah, I mean we have a lot of incredible produce here and I have gotten so used to it in some ways. But I still really appreciate, particularly if I actually take the time to taste what it really tastes like, to bite into a delicious tomato or a delicious green. You were saying that Francis also used to cook in her studio, was that what you were saying? Yeah, she was used to this idea of cooking for herself at lunch time. Because usually people that live in London eat a sandwich, you know. So actually cooking a warm meal, lunch, is something quite unusual nowadays. Now she is a sculptor? And I was curious about the ways in which she might inspire you because in a partnership, particularly when it’s two creatives, you tend to inspire each other. And what are the ways in which you find inspiration through her? We trust in materiality, the material. Be it wood or metal and what ever. And I think the color comes towards the end. I have to choose color now. So then when a figure changes the chair can also change. So thinking about different figures. Yeah I think many many more ways [she inspires me]. And it’s hard to sort of pin point them all. Yeah. But also I think the craft aspect: We both kind of share interest in craft and making things. I just came back from New Zealand and usually when we are there, we work with craftspeople. Be it potters or weavers or jewelers. People who somehow make things in their own way. And I think we both appreciate that somehow. There is a real bond amongst people that make with their hands. I guess she opened my eyes differently to art work that I kind of knew from my college days or, you know, the connection I had to art work. So yeah, we can travel really well together, when we go, we kind of both find a way to do our work and I think that is quite healthy in a way. We can travel and work. It is really healthy, it is very compatible. Which is the best thing. So when you were a kid, can you remember when you realized that you had this creativity inside of you? Was there an experience that kind of made you realize that? That you thought differently or saw differently? Yeah. I always liked to play with my hands and that was a big problem in school. I was quite hyperactive and they couldn’t quite find a way to teach me and my mom was very frustrated. Because she was trying everything that she could do. But one teacher told her once that she shouldn’t be worried because there is nothing she can do or he can do. He said, “he will find his way”and I think that’s something she only told me afterwards. [Laughs] She never told me there and then. She always thought there was hope. She always thought like she was kind of observing at one point and she was realizing, ‘I just want to observe what he does. Apparently he always finds a way to deal with any situation, finds a way to deal with it,’ and she realized that there was some kind of creativity in that. Whatever mess I would get myself into, I always found a way to kind of get myself out of it. Mostly in a creative way. And she realized I really love to use my hands and then when I kind of left school at age of fourteen. That’s when you leave school in Italy—. —at the time, twenty years ago. Now it’s sixteen but at fourteen basically you could get a job or you go to higher education or you could do whatever, stay at home if you wanted to. I was actually younger because I am born in December, so I was actually like thirteen. So I went to do a foundation course that was basically wood working, metal working and a bit of engineering and electronics so on. And it is basically like a foundation where you try to understand what you really want to do. That kind of really opened my path to be able to do, create my own objects and techniques. Such a young age it’s incredible. Martino: Yeah, but you’d be surprised. I think it is an age where teenagers respond really well to be given responsibility over what they do. Medium and I got myself an apprenticeship at the local cabinet maker. That was really good, I mean it was an old school cabinet maker, master cabinet maker, very bespoke, we only made furniture for people. All kinds of things, from kitchens to living rooms to anything out of wood. And that really kind of taught me a certain kind of rigor. I think I was just over fourteen, I was starting to not necessarily respond well to authority [laughs]. He [my mentor, the senior cabinet maker] was tough but at the same time he was also very patient. I learnt a great deal from this guy and also his son, who was a bit younger so that kind of helped me a bit as well. He was in there too? Yeah, his son was in his 30s then. And that really helped me to kind of see one thing through and also go to school. It was basically a dual apprenticeship scheme where you work four days a week and one day a week you go to school. And the school is paid for by the government so that day you lose at work is paid. So basically it is in an employer’s interest to send you to school. So that means you’re not completely dropping out of school and you can have a diploma at the end of it. It’s a very interesting system to combine learning and kind of making. And I guess that’s been something that’s been following me since then where it’s kind of the thinking and the making. Everyone describes the the left hand or the right hand of your brain/ I find it quite difficult to completely have a seamless overlap between thinking and making. I guess that’s a challenge you know. You think about something, you observe something and then you think of transforming it into the making. That’s a challenge in a way. Absolutely! That is it. How do you translate what you see in your mind into something. How do you make that? Yeah, it’s kind of a moving–. A moving target and it’s kind of you know not really measurable in a way. You sometimes don’t wanna accomplish exactly what you saw in your mind. No. Totally not. Because suddenly you realize that was really a bad idea! You know, here in America, we have such a prolonged childhood in a way or I should say adolescence. You don’t have to really decide what you are gonna do until twenty two or something. Even in college, you take a bunch different classes. And it is really interesting to do something quite different, to actually discover what it is at such a young age and then just hone and perfect that skill over time. Yeah. Yeah I think fourteen is actually quite an amazing age. You know it’s not for your life time. It is a passage. I mean from 14-20, you do whatever you do. And from twenty onwards that is a another eternity. And, I think given that, you don’t have to sometimes focus on something, I think it’s very good. Because I think we live in a society where everything is very easily changeable and you switch from one thing to the other. And I think, especially for who I was at that age, quite restless, quite hyperactive, I probably would have given up after two months and said, ‘Oh that is not mine’. But somehow I had this job, I had this master, I had money so it was good and also the independence. That meant I could go traveling off if I wanted to, at a very young age. Having your own kind of income. You can confidently experiment when you actually know what it is that you are doing and when you have that kind of traditional foundation. Does that cabinet maker know what has happened to you? He is a very modest kind of guy. He is in an old in design world, you know he is cabinet maker. But, still, I think he is quite proud in a way. And how about your mom? Now that you have turned out this way. She must be proud of herself for having trusted. Because you were like the worst [laughs] student or scholar. How did you get an MA at the Royal College?’ It was beyond her. Because she didn’t really realize until then. You know she knew that I was going to the university at one point. She knew all those things but they were kind of far away. [laughs] The same thing happened with my sister-in law. She is a [world renowned] ceramicist and she got her masters at the Royal college of Art: Tanya Gomez. She had this very non-traditional trajectory. She travelled the world for five years. She was dyslexic but it didn’t matter. I mean, she’s got the talent. But I think that puts a question mark on our education system or conventional education system that I guess works for a lot of people but does not work for a lot of other people and I think earlier on we need to spot those people who obviously don’t necessarily fit in 100% with that particular system. I guess I was lucky. She [Tanya] was also lucky and many other people as well. But there are a lot of people actually left on the road who know that they have the passion but they they don’t know how to get out of that kind of [system]. I feel for those people. Because it is very hard to have a passion and a talent and not be able to express it and use it in your life. And being kind of made to or feeling, at least, that they are stupid. I mean because that’s what it comes down to: Your grades are not good, you are not performing, you are basically dumb. I think it is tough for a lot of kids. Or just a maker, right. That is my favorite title: Maker. How do you like those distinctions being made and do you think they are kind of frivolous and a bit unnecessary. And the second follow up question to that is, therefore do you see furniture as a medium? Or are you a furniture maker and you do all these different things with it? Could you have easily expressed your ideas through jewelry or through ceramics? So it is a medium or is it what you do? Foremost, I define myself as a designer because I make objects that are there to be used and for me that is a very banal and simple thing. You know, something you look at vs. something you use. Something you look at is my wife’s work. She makes work to look at while I make work to sit on. Now we can discuss about the functionality and all that because you can say it doesn’t look functional. That is certainly a different conversation but I primarily make work that is kind of applied, you know. I work within art institutions and art galleries. The Serpentine, as a curator, but I’ve also done shows in commercial art galleries as well. But for me that is secondary, that is in the market that has nothing to do with what the objects are [laughs]. Is it a small boutique shop or is it a supermarket? I mean the product still can be the same. And I think a lot of people confuse the marketplace with the actual object. So for me that comes secondary. For me, you know, I am really doing what I do because I wanted to have certain freedoms in working in other mediums and cross fertilization and work with a bit of overlapping. you know and say while the boundaries are(00:26:12) you know kind of not that clear. Well lets just may be not even worry about it then because I think the problem is when you try to be too compartmentalized you know (00:26:24) about things. It was all about , ‘is it or isn’t it’, and it was like, ‘we don’t know unless we do’. We already have such a globalized world. Are we really gonna argue about whether this would be closer to Art or Design. I think we should embrace in a way that a lot of people to work together and create synergies. And that’s the thing. That was the project I did with Francis, my wife, and Carl Fritch, the jewelry designer, the show in New Zealand four years ago, maybe five years now. It was called Gizan Kuntz artwork. So it was about the overall, the complexities all together. The hand was some of part of it: made by hand, as in handwork, as in craft. And that was really mixing it all together. You couldn’t even tell who made what. So that completely blurred all the boundaries. It is not about, ‘we put our work next to each other,’ but was really about, ‘I work on top of other people’s work and they work over mine’. I think that was an interesting experience, an experiment as well, to see. Let’s just completely erase those questions and see what comes out there. Yeah. A lot of people I think in the art world find me quite annoying. Because I kind of do things in a much freer way. As a designer, I think you have a lot more freedom in certain ways. Sometimes I feel like artists can be…It really depends in the personalities, it is too difficult to generalize. I know a lot of artists who have to take things a lot more seriously because art is something serious. And so they see me as, ‘you see that is kind of an annoying guy, he just plays and has fun’. I agree that art can be serious and I think there’s some serious art out there. But I think it should be serious because it is engaging not because it wants to be serious. I think it is the same with design. Design is also something serious but it can also be refreshing, it can be challenging, it can be all kinds of things. So I guess as soon as you kind of think if it should be this or that you also come into the arena where design should be like this or art should be like this. And I feel like that misses the point. So within those disciplines, I think there needs to be enough freedom, then there is place for everyone. And once there is a place for everyone, those boundaries disappear anyway. And of course what remains is maybe the market place where things, in a global world, are shipped around the globe five times until they reach the final customers. For myself, as a person that works with sound and mixing it and changing it and forming it, there are ways in which I wish I were freer. I wish I would allow myself to experiment more. I am sure a lot of designers feel that way. Do you have advice? Part of it is character. I think it is something that you are born with. The ability to let go. The ability to really be clear about what your instincts might be and do those. I think for me it comes back to those moments that we talked about earlier on about school. You realize at one point you’re just not good at certain things and however hard you work, it is not gonna happen [laughs] but you compensate and I think that is something really amazing about the human being, this ability to change, kind of put energy in something else and compensate. It is a kind of evolution in a way, to think very fast. Human beings are super quick, they kind of compensate and learn from the experience. So I think at one point I realized that I wasn’t good at compensating with something else and that process of compensation became a creative process. I said, ‘okay, I have to find another way of doing this,’ because I simply wasn’t good in writing. I find it very difficult to write a text. So then I had to find another way of communicating what I was trying to say [and that was] by making something. So, you realize that becomes a tool but it also becomes a very free tool because nobody has defined that world yet while writing is very much defined. In that sense, I had to create my own way of creating that new language. And I think that a lot of times it comes back. I know that I wouldn’t be good at doing certain jobs If I did them in their very standard way, if I followed the kind of textbook. So I realized, ‘okay, because I can’t do that anyway, I gotta find my own ways,’ so you find your way into a project, you find a creative way to generate ideas basically. When you think of the people that influenced you before you were fourteen, when you were child, who do you think of? Who comes to mind and why? For instance, I don’t know who influenced me in my career but who had a huge influence on me as person was my grandma. And so I named our daughter after my grandma because she is so important to me. When you think of someone that influenced you creatively or as to who you are, who comes to mind? Now, I think this really innocent childhood, these kind of moments where you actually don’t know what you are doing but somehow you’re expressing yourself in a kind of primitive, free way. Free kind of way, yeah. Now in your accent, you know I am listening to you through the headphones. I mean I would have never guessed you were Italian because of your accent. So why is that? Even though it seems like it is a very old, ancient country, Italy is is 150 years old and it’s made up of a lot of small states or provinces. And one of the provinces that I grew up in has got two names already so you can imagine. It is basically what was annexed from the Austrian-Hungarian after World War One so it became Italy from what was predominantly Tyrolean Austrian culture in a way. It is got autonomous region where basically there are two official languages, German and Italian. So every street sign is in two languages. It’s even three languages because there is a third language called Ladino. And it is not the Jewish Ladino that they speak in Spain, it’s also called Romande in Switzerland. It is what basically remained from the Romans when they moved, probably when the Roman Empire collapsed. It is basically a dialect of that remained, some of those valleys in the alps for over 2000 years. And it is spoken and written, so it is an interesting thing. It’s almost the center of Europe, middle Europe, but then again far away from everything because it is in the middle of mountains. So I grew up in a border town. So in school you learn German and Italian or Italian and German, either way. You can go to German school and learn Italian or Italian school and learn German. So it is a slightly confused place a little bit identity wise, people are not quite sure. This just is a perfect metaphor. No, for your work, I mean perfect. But also I think a great opportunity because you somehow grew up between two very strong cultures, I mean strong cultures in Europe. If you are Germanic, that means kind of anything north of the alps, Austria, Germany, Switzerland and so that kind of thinking and humanity and in the south is very impulsive you know. Fiery. So you kind of grew up in these two places and you are like, ‘Wow, it is amazing. This is amazing but that is also amazing’. So, now I kind of spent some time in Vienna, when I studied, I came back to Italy, worked in Milan. So for my work, I greatly profited from that because I could understand both sides, I was somehow a translator for both sides, and you kind of create. For some people, it is very confusing and they have big identity crises because they don’t know. Also, because wherever you go, I say you couldn’t pick up my accent, where I am from. So you probably think I am German, Dutch or Danish. Some people say Swedish. So there is this funny thing people never believe that you are Italian. Not even in Italy, people think I am not Italian in Italy. I get, many times, when I travel people speak to me in English [laughs]. So you go like, ‘come on,’ like. It’s been annoying. Sometimes you go, ‘well, I would just love to have this one place I belong to, where I am recognized.’ Also, my mother tongue is not Italian. So it is interesting. You are a bit like many people probably in the States. Their parents are from somewhere and they don’t speak the language outside their house but actually that is their mother tongue and that is the language they actually could communicate best in. But I think for me I find it quite interesting . You are not placeable. Even though I have very strong roots in that place, I have this very strong connection to the place, to the nature, because it is a very strong place. Culturally, it is a very strong place, it has a lot of tradition, it is very ingrained still. I see it as a great, fortunate place to grow up. I did a project a few years ago called, “I am when I speak”. I did it with my family because they speak different languages and they are from different places. And it was all about who they are when speak a given language and it showed how many different things they feel they are which actually is an advantage. You can feel really profoundly and powerfully with these different parts of yourself rather than just feel one thing. And actually that can be really enriching. I think it can be confusing for some but if you are open–. –to it, it can be very freeing too. Absolutely. And I think a lot of people are scared because they think they lose themselves until they create their own “I”, you know their individual[ity]. But I wouldn’t be doing what I do without that kind of cross fertilization, without having lived in those different places and picked the best of both worlds [laughs]. The kind of super emotional kind of southern with the maybe more thoughtful, kind of orderliness [of the North]. They collide but sometimes they both have a certain intensity, I think. So you have to exist in the commercial world, I mean you have to sell your things. How do you feel like your furniture and your way of thinking fits into that world? A contradiction in a way but also those people givE me the possibility to really do my work and there is this sense in the design world that “design is for everyone” and it’s a relevant conversation I think. But I think this “design for everyone”, I think it’s got some kind of flaw in there. I have been thinking for years about this and there shouldn’t be any objects that judges for everyone, anyone, anywhere because I feel like we don’t want all the same things. If it happens, it is great! I think if people do use it, there are some objects that are all around the world we use. Maybe kitchen utensils, something that you wouldn’t even put a name to the design object but it is designed by someone, it is made by someone. But I think other than that, I think anything else kind of enters another category where people actively choose certain objects. And I wouldn’t want to see every house the same, that would be horrible. It’s already horrible enough to see IKEA, I mean I don’t see IKEA as the evil thing in the world but I see them as trying to probably seek corners of the market and they are very good at it. But I see too many flats already looking too similar. So why should we all have the same thing? Why should we all wear the same thing in a way. So I think having a more diverse world with many more objects and maybe smaller production I think gives a lot of people more work. So I am kind of contrary to that idea that “all design for everyone” but people don’t want all the same thing. There are certain lifestyles, people want to buy into a certain lifestyle. There are many different ones, there are many different lifestyles. Not even talking about economics because I mean everyone means that there is 20% of the world who can actually buy anything. There is 80% who are actually not even anywhere close to whatever, water or anything. So how can we even talk about “design for everyone”. I mean there are these more primary needs to be dealt with. So, of course, you know as a designer, I very much cater for the top 2-5 % but then again, I have produced some plastic stools that I designed that are in many friend’s houses and they are being used and they are being kicked about and used in all kinds of objects: planters, as little bust ups for their children. And I feel like, sometimes you design something that has much larger reach out there and other days you do things that are much more pointed towards the individual, like someone’s house. But if it is a table, it’s hopefully gonna last. Because it has high price tag, it will last and people will not chuck it out. They will keep it and they will pass it on to their children. I think that’s the most sustainable way of making objects that they are actually looked after. They have a certain value. My auntie, she lived in the mountains and she had a cupboard, a very beautiful kind of alpine style painted cupboard. I don’t know, it was always just there and I didn’t even notice it because it was just part of the vernacular and one day I looked at it when I visited her and I said, ‘oh, now I really see this piece of furniture. Who made it?’. She said, ‘Oh, a local cabinet maker made it,’ and I said, ‘But had you commissioned it?’, ‘Yes we commissioned it.’ She and my uncle commissioned it shortly after they got married, a few years later. And I said, ‘well how much did you pay?’, just to get sense of scale of economics and she said, ‘well, it would have been equivalent of almost a cow.’ And that was a lot because they didn’t have any cows. And I was always putting that kind of a calculation into what it meant today. So, meaning if you have ten cows instead of one to make a piece of furniture, that is 10% of your ownership in that sense. So if you did that now, that would be a lot of money now. And she treasured it her whole life and now it is in my cousin’s hands and may be passed down the generation that says you know, the cupboard from grandma and whatever. So that was very important to them, it was a very important kind of thing to have made and I think if we have more objects like this in the world, things might look different. And they might have to be fixed and may be need some who can actually fix it. So it could be different economy, you know I am not saying we don’t have to buy anything ever again because we just gonna get the old stuff but I am saying that there is other ways as well, there are other models as well. And I am very interested in commissioning. I mean I do a lot of commissions. Once you know who those customers are and have a one to one relationship and really make something for a place. Yeah, bespoke and I think there is a certain ingenuity in that, to kind of really create something new and special.